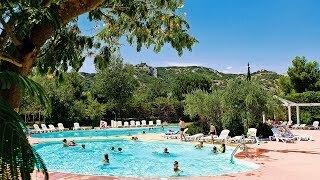 Camping Ile des Papes is a large, open and very well equipped site. Avignon and its palace and museums are 8 km. away. The site has an extensive swimming pool area and a fishing lake with beautiful mature gardens. The railway is quite near but noise is not too intrusive. The 396 pitches, 187 for touring (all with 10A electricity), are of a good size on level grass, but with little shade. Games and competitions for all ages are organised in high season. This site is very popular with groups and is especially busy at weekends and in high season. In July and August, a minibus is available for transport to Avignon, the airport and the railway station; the local bus can take you directly to Avignon. 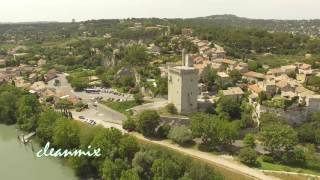 A good base to explore the famous Routes des Vins and the old villages and ancient towns of the Provençale region. There are many walks and cycle routes close by. Leave the A9 at exit 22 (Roquemaure) and take D976 to Roquemaure, turn south D980 towards Villeneuve. Near railway bridge turn hard left, D780 (site signed). Cross river, immediately turn right to site.